Los Angeles (March 7, 2017) – Helinet Aviation, one of the largest and most respected helicopter operators on the West Coast, announced today the appointment of Kevin LaRosa II as VP of Aerial Film Production. LaRosa brings his extensive experience in coordinating large scale aerial sequences and flying for Hollywood’s top films to Helinet’s growing production department. Known for his work on The Avengers (2012), Iron Man (2008), and Transformers 5 (2017), Kevin has worked on over 100 different motion picture and commercial productions. He is an ATP rated pilot trained and certified in a multitude of rotorcraft and fixed wing aircraft. He also holds type ratings in several Learjet models as well as the C-130/ L-382 Hercules and the Sikorsky S-70/ UH-60. In addition, Kevin holds an FAA Part 107 UAS rating for flying unmanned aircraft for the film and television industry. Kevin has been working heavily in the film industry coordinating and directing multitudes of aerial film sequences in the air and on the ground for over 16 years and is a member of SAG and the Motion Picture Pilots Association. With the largest fleet of single and twin-engine turbine helicopters on the West Coast, Helinet has been severing the film production community since 1987. 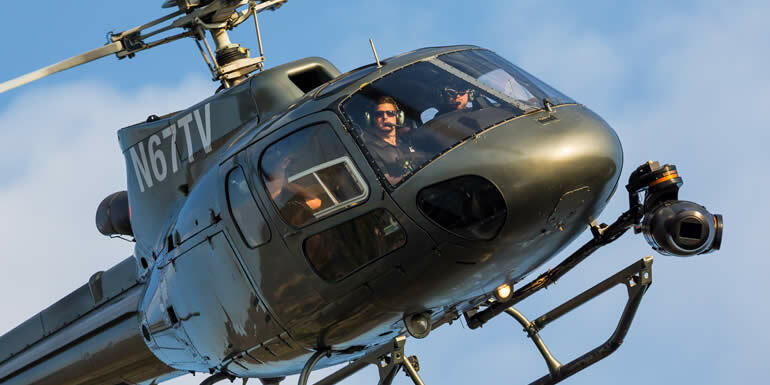 From script breakdown, FAA paperwork, to pulling in the right assets, Helinet provides turnkey aerial production services within the United States and abroad.